Volunteered to be the face of evil. 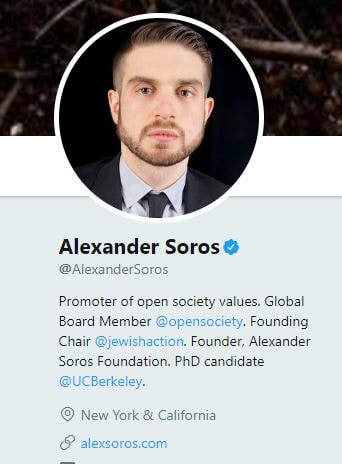 While this coward's even more cowardly cronies hide in the shadows, content to be silent investors in the globalist agenda, Soros and his son find the attention very palatable. This is Alex. Don't be like Alex. Pathetic trust fund baby following in the footsteps of his father into the nether regions of corruption. Neither has contributed anything positive to society. Any surprise that he is linked to UC Berkeley? His website is a self-made shrine/monument to himself. All ego. Look! I paid newsmedia to run stories on me! I am a hero! This child that has never had a real job in his life and live's off of his daddy's ill-gotten money wants to call us beneficiaries of white privilege?